Xiamen presents itself to the world as host of the BRICS Xiamen Summit, which kicked off in the city on Sunday. The Fujian Province city is an important economic center on the southeast coast of China, as well as an international port and popular tourist destination. In 1980, the establishment of Xiamen Special Economic Zone was officially approved by the State Council, which has put the city in a great position to help support the Belt and Road Initiative, an advanced platform for cross-strait exchanges, cooperation and a civilized harmonious nation. According to the Xiamen Daily, the city has invested more than $6.69 million in the other four BRICS countries, covering retail, infrastructure and manufacturing industries. In October 2016, China announced that Xiamen would be the host of the ninth BRICS summit. Since then, the city has been preparing for the event. The Global Times reporter in the city saw strict security checks since arriving on Friday. Armed police were patrolling Xiamen's Gaoqi International Airport and every hotel guest is required to have their picture taken by police during check-in. The city has also limited the number of visitors to the island of Gulangyu, a World Heritage site that boasts varied colonial-style architecture. The usually crowded and noisy streets of the historic island fell quiet on Saturday. Parcels posted to Xiamen have also had to go through stricter security checks since early August, a local resident told the Global Times. Traffic restrictions based on the last digit of license plate numbers have also been in force since Thursday. "I understand that these actions are being taken due to security concerns," Xiamen resident Xu Dan told the Global Times on Saturday, adding that she hopes the world will learn more about Xiamen through the summit. "Where does Pelé, the king of football, come from?" "Which country hosted the BRICS summit in 2011?" On Xiamen Airlines Flight MF8118 from Beijing to Xiamen on Friday, passengers were quizzed about the BRICS countries and those who answered correctly were given small prizes. The local airline, Xiamen Airlines, is one of the sponsors of the summit. They have helped train volunteers and given their crews new uniforms especially for the summit. "The BRICS summit is an opportunity for the city to progress, so we will do our best to be good hosts," a crew member said. The BRICS Xiamen Summit is the highest-level international conference that has been ever held in Fujian, let alone Xiamen. Besides Xiamen Airlines, many other local enterprises and individuals are also participating in the event. For instance, Panpan Foods, which is based in the Fujian city of Jinjiang, is the official snack provider to the summit. Taxi drivers in Xiamen also have organized a voluntary team to offer convenience to attendees. Since the beginning of the year, Xiamen has set up volunteer service stations around the city in order to better serve the international conference, according to a Saturday Xinhua News Agency report. Currently, volunteers are active in every community, street and station to provide services to the city's guests from all around the world. Xiamen citizens have a long tradition of volunteering. According to Xinhua, there are more than 3,000 voluntary organizations and 505,000 registered volunteers in Xiamen, accounting for one-eighth of the city's residents. According to Xinhua, the volunteers are mainly students at Xiamen's universities, including the famous Xiamen University. Brazilian, Russian, Indian and South African volunteers have also been recruited from the foreign populations of Beijing, Shanghai and Guangzhou. After several rounds of tests, more than 2,000 volunteers were officially enlisted out of the 30,000 applicants. The volunteers then received language and etiquette training in order to provide services to the delegates, including translation and consulting. In recent years, from the APEC and G20 forums to the Belt and Road and the BRICS summits, high-profile diplomatic events held in China have enabled young volunteers to grow and to take more and more important duties in China's diplomacy, Xinhua said. "Xiamen, as the host, will provide complete, warm-hearted and professional voluntary services to guests and friends from all over the world. 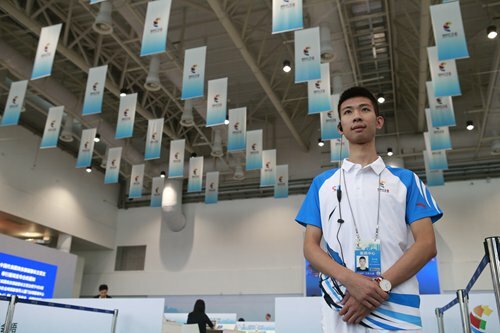 Through the presentation of the young volunteers, we hope to show the beauty of the city," Zhao Qiuxi, member of the Xiamen Communist Youth League's standing committee, was quoted by Xinhua as saying.